Series III is based on Coherence: The Right Drivers in Action for Schools, Districts, and Systems by Michael Fullan and Joanne Quinn, who will also be leading each of the four sessions of the series.This series is about taking action. It is designed to build the knowledge and skills to foster greater coherence and capacity to implement effective, sustained PreK-3 systems to support learning for all students. Superintendent-led leadership teams progress from analysis to action, achieving coherence in four areas: 1) Focusing Direction: Refine and monitor the district’s direction while assessing the impact of PreK-3 strategies. 2) Cultivating Collaborative Work Cultures: Build precision in facilitating collaborative work cultures. 3) Deepening Learning: Assess the current district conditions for fostering deep learning. 4) Leading for Coherence and Mastering the Framework: Develop a leadership framework and tools that maximize and sustain learning. This four day series is the third part in a professional learning series designed to support MN schools, communities & districts with implementing effective, comprehensive PreK-3 systems. In partnership, MESPA, MASA and the Minnesota Department of Education have created the series. This series focuses on taking action. Based on the work of Michael Fullan and Joanne Quinn, and led by Joanne, it is designed to build the knowledge and skills needed to foster greater coherence and capacity to implement effective, sustained PreK-3 systems in Minnesota schools, districts, and communities. The article below provides a good overview of coherence. Register through the Minnesota Elementary School Principal's Association (MESPA) website. Joanne consults internationally on whole system change, capacity building, leadership and professional learning for governments, districts, professional organizations and institutions. Joanne has provided leadership at all levels of education as: a Principal and Superintendent; Implementation Advisor on nine provincial reforms to the Ontario Ministry of Education; Director of Continuing Education at the University of Toronto; and as Special Advisor on International Projects. 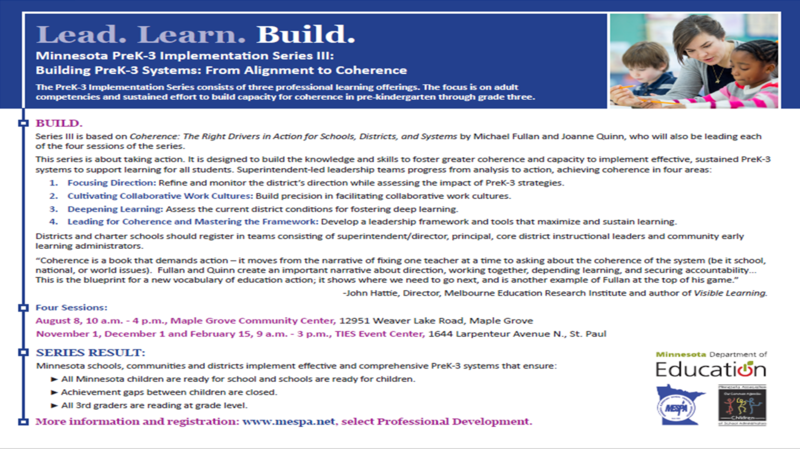 Her latest books are Coherence: The Right Drivers in Action for Schools, Districts and Systems (with) Michael Fullan and The Taking Action Guide to Building Coherence in Schools, Districts and Systems (with) Michael Fullan and Eleanor Adam. Joanne currently leads the design of strategic whole system capacity building at the global, national and district levels with Michael Fullan and is co-leader of the New Pedagogies for Deep Learning global partnership. Click Here, Michael Fullan, Education Canada, December, 2015. Rubik's cube is more than a puzzle- it's a question waiting to be answered. And when the right person finds the right question, it can set them on a journey to change the world. We salute Ernő Rubik and everyone helping young minds find the questions that challenge, excite, and let them see the world in a new way. There's a quotation which BEST suits to this video,"Be the change that you want to see in this world." Must watch video and it teaches us that we should not always have to wait for others or things to happen of their own . Com'on get up and get going, and rock this world. Michael Fullan OC, with the support of Pearson, films Peel District School Board's Director of Education Tony Pontes, with administrators and teachers, to capture the results of Peel District School Board. This video is part of the publication, "A Rich Seam: How New Pedagogies Find Deep Learning" (Pearson, 2014), and what Fullan calls Motion Leadership in Action. Three Step Interview: What is your tree? Listen to the words of Steve Jobs, Richard Branson, and Seth Godin and you'll discover what separates true innovators from everyone else. Click Here, Article and video. The Perfect Storm: How teachers at Central Peel Secondary School started a conversation about teaching and learning that is now driving whole-system change. How do we engage others? Competency Assessment - Where is our district? Create a visual that captures your focused direction and strategy. Complete the Coherence Self Assessment Protocol. Bring your profile and identify one area you need to work on.